Size of this PNG preview of this SVG file: 375 × 469 pixels. Ither resolutions: 192 × 240 pixels | 384 × 480 pixels | 480 × 600 pixels | 614 × 768 pixels | 819 × 1,024 pixels. 17:55, 7 Julie 2018 375 × 469 (1.03 MB) XrysD Corrected Irish name for Carlow to Ceatharlach. Fixed scaling to 100dpi to match original sizing. 18:41, 5 Julie 2018 375 × 469 (1.03 MB) XrysD Updated version. Created using GIS data from Ordnance Survey of Ireland (OSI Opendata https://data-osi.opendata.arcgis.com/) and Ordnance Survey of Northern Ireland (OSNI Opendata https://www.nidirect.gov.uk/services/osni-open-data-portal) to re-create the actual traditional county borders, not just the existing Irish Republic county borders in the previous map. Added ColorBrewer derived shading to differentiate counties visually. 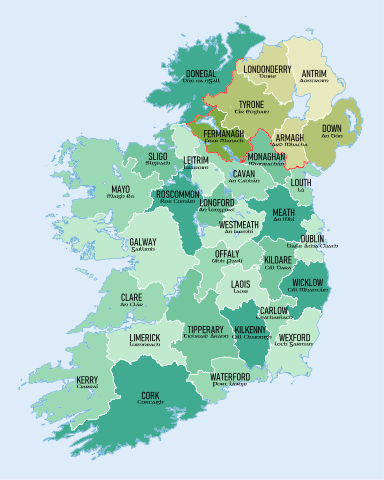 Added Irish language names for counties.